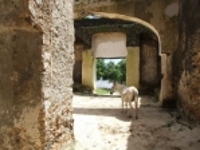 If you are looking for a place to escape the bustle of Stone Town for a few hours, head north to the peaceful Maruhubi and Mtoni Palace ruins. Sultan Said bin Sultan first built Mtoni between 1828 and 1834 after he left Muscat and made Zanzibar his throne and it was also the childhood home of Princess Salme. The decadent Maruhubi Palace was built later in the 1880s by Sultan Barghash, as a harem for his 99 concubines and wife. The structure was mainly wooden and one of the most beautiful of its time, but was gutted by a fire in 1889 and left in ruins. The rolling lawns, bathhouses and water lily ponds are reminiscent of the life of affluence enjoyed by the palace residents over a century ago. To view a well-preserved Hammam from the 1850s continue north to the Kidichi Persian Baths, constructed by Sultan Seyyid Said for his Persian wife. Local buses stop near the palace ruins and there is no cover charge to explore, unless there is an event underway - the site is used for concerts and lectures and travellers should find out if anything interesting is happening during their stay in the area.